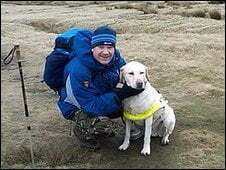 A blind man and his guide dog are about to embark on a charity walk, lasting eight days, to raise money for Guide Dogs. The man, Scott Cunningham, and his guide dog named Travis, are to set off on their charity walk in April, covering the West Highland Way. The charitable duo has already raised over £60,000 for guide dogs, which has gone towards nine guide dog puppies and their training. Travis is also a record setting dog, having become the first guide dog to make the walk, all ninety-five miles of it, when he walked the West Highland in 2003. The pair have a made a regular thing of their charity walks in recent years, coving many of Scotland and the North of England’s most daunting walks. Not content with just completing the walk, Scott and Travis hope to make it to Ibrox in time for Rangers’ home game against Motherwell, which takes place on April 11th. Scott is a big Rangers fan, and will even have the company of a former player when he makes the trek. Travis and I have been thrilled by the support our cause has gathered in the build up to the latest adventure and this visit to the parliament will hopefully help raise even more awareness. While the main thrust of these treks has been to raise money for the Guide Dogs, I hope that I am also able to inspire other people to embrace challenges, big or small and experience the same sense of motivation and reward that I have gained from my expeditions. The money raised will be invaluable in helping to train more guide dogs like Travis. Gillian Moffitt is the fundraising manager for the charity Guide Dogs. She explained the implications of training guide dogs, and how the money would help. I have known Scott for some time and his appetite for adventure never ceases to amaze me. He is a shining example of how blindness needn’t prevent people from achieving their goals. Training guide dogs is a hugely expensive undertaking. The money that he and Travis have raised together has helped us to train future guide dogs which will provide vital assistance and companionship to blind people in the years to come. This story is cute and encouraging. me,my daughter dee & workmates elspeth & graeme were heading up on to rannoch moor when we met scott & his fellow fundraisers who had just crossed the moor & were heading for easier terrain , we had a 2 minute chat , i floated across rannoch moor to kingshouse afterwards , such was the inspiration i got from that chat,more power to you & travis , D.